1.1. Periods grouped by months and days of month. 1.2. Periods grouped by week number and days of months. 1.3. Periods grouped by days of months. 2. If this option is on, periods for all tasks will be displayed in the period list. Otherwise, periods from selected projects or tasks will be displayed. 3. If this option is on, data from hidden projects and tasks will be displayed. 4. If this option is on, seconds will be abandoned in time display. 5.3. Decimal. Time in hours with one hundredth resolution, e. g. 123.75 (123 hours 45 minutes). 6.1. Separator before project/task name. 6.2. Separator after project/task name. 6.3. 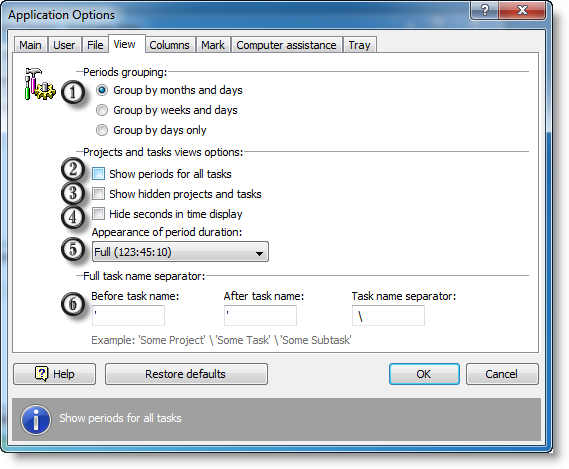 Separator between task names.